This is an incomplete list of generous people that donated items in the past few years. I know there’s more people I should definitely add to that list. Feel free to drop me a reminder, as the memory banks are often overwhelmed. A few weeks ago, my good friend Stretch Riedle donated his LOUIE LOUIE VHS collection, which is a massive collection of TV shows, archival concerts, and odd little LOUIE LOUIE moments. I’m guessing it’s at least about 50-60 pounds worth of videotape. Even though we regularly compare notes, and see some great concerts over the years (including that Patti Smith show in Santa Cruz a few weeks ago – INCREDIBLE!! ), I’m surprised to find some LOUIE items I didn’t know about. With this in mind, I plan to unravel and decipher some of this material with a new set of “LOUIE on TV” notes which I’ll be sharing on this website. Before I get started on this task, I think I’ll start off by acknowledging some the more recent LOUIE-centric TV moments that aren’t part of this collection. 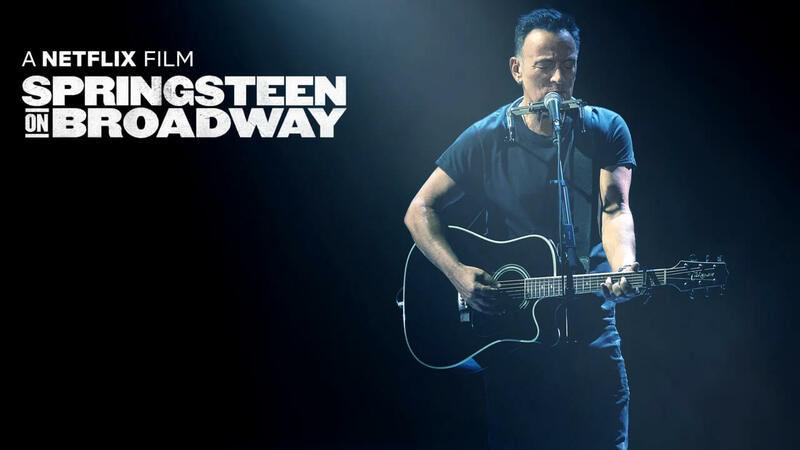 Springsteen at Broadway (Netflix) is a wonderful video representation of a concert residency by Bruce Springsteen at the Walter Kerr Theatre (NYC) that lasted from October 3, 2017 until December 15, 2018. The show is a reenactment of his 2016 autobiography, which features some stripped-down performances of his songs performed solo, which in ways, often feel more powerful than the original studio recordings. And yes, there is a special moment in this performance one could call a “re-affirmation of LOUIE,” but I’ll avoid specific details, as I don’t want to be the spoiler of such things. I’ll just mention that somewhere around one hour and twenty-some minutes, Bruce acknowledges a higher power of LOUIE, or something like that. Highly recommended. 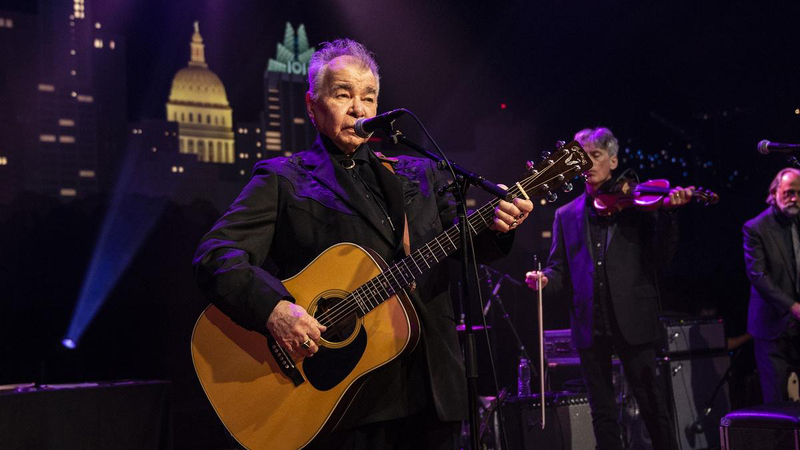 John Prine on Austin City Limits (PBS), was another fine concert shared via the powers of television. I think it was first aired sometime in October 2018, but I didn’t see it until December. (Gotta love those Tivo gizmos!) 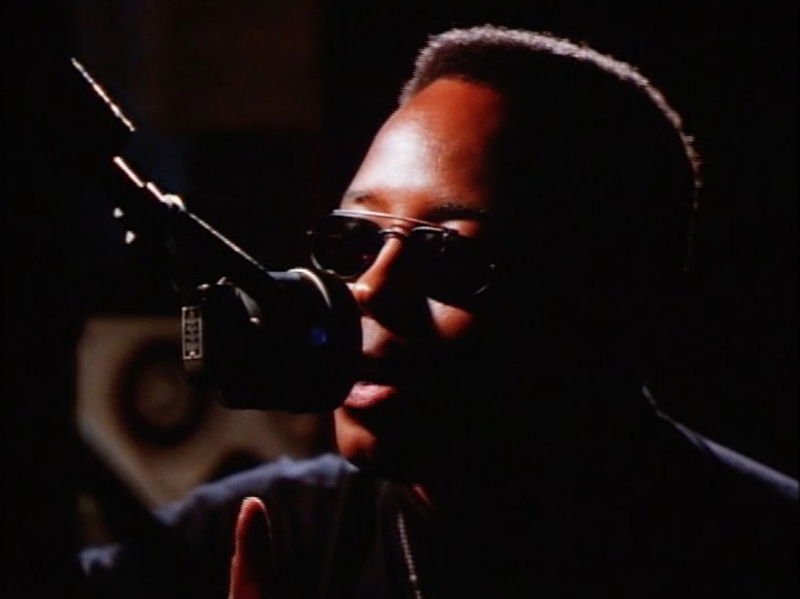 His LOUIE reference took place during his performance of “Lake Marie,” which may or may not appear at the 41:10 mark, depending on the timing of your local PBS pledge drives, which of course, I fully support. After that, I’ll mention a few vintage TV shows that feature LOUIE. 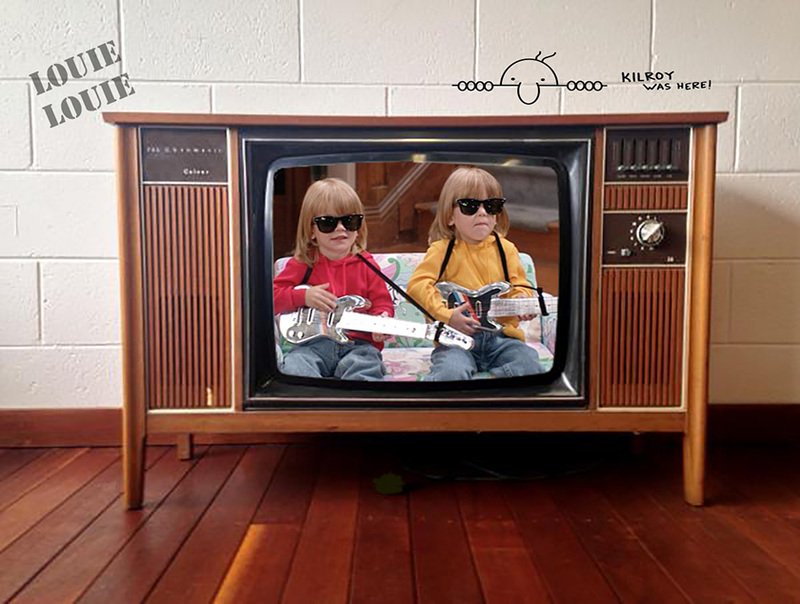 Before I inherited Stretch’s serious collection of VHS tapes, I had already been tracking down upgraded copies of the old TV shows that featured LOUIE LOUIE, acquiring DVD reissues of these older TV shows whenever possible. This features a recording of LL by an unnamed band that tried to replicate Jack Ely’s vocals with the Kingmen, shared 3 times. 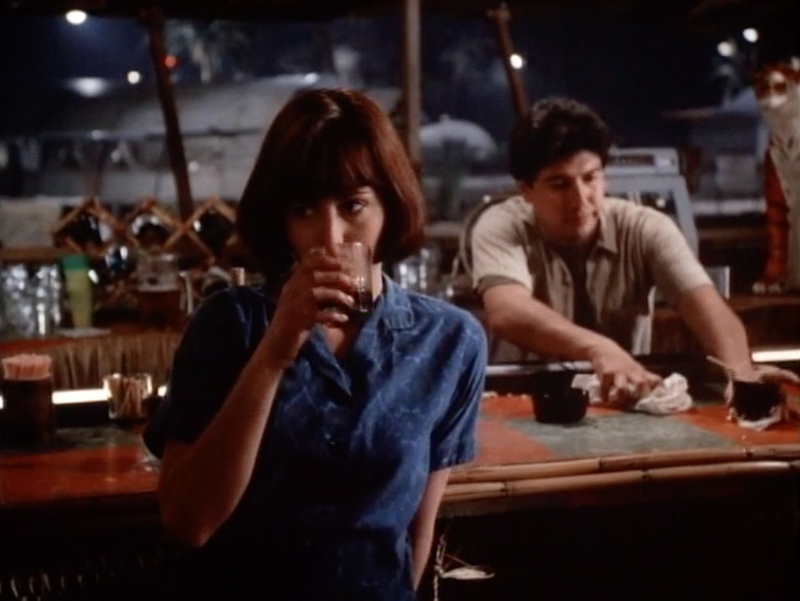 29:55 – Julie London LL recording played as Colleen McMurphy (Dana Delany) walks through military camp bar. UPDATE: Thanks to a VHS tape shared by an associate, I learned the original TV broadcast used the original Kingsmen recording with the Jack Ely vocals. I’m guessing the price of re-licensing this recording for the DVD release was more than the producers wanted to spend. 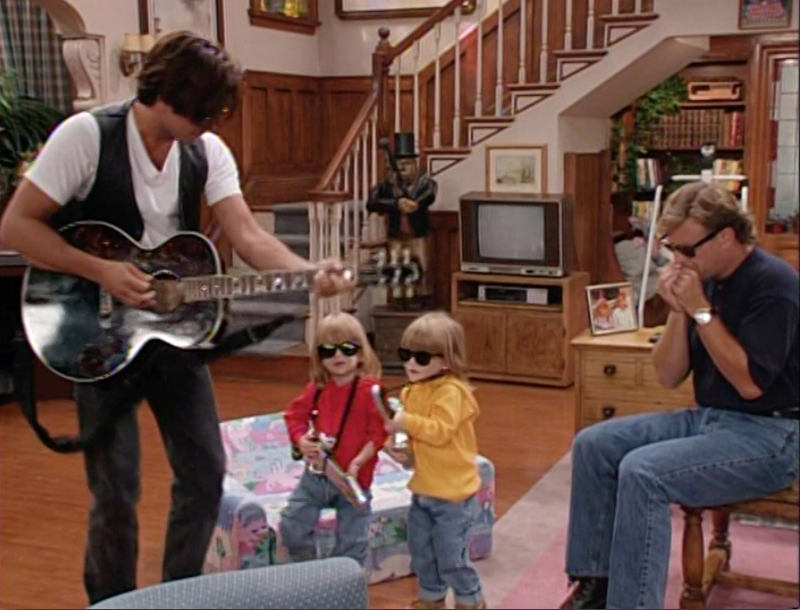 00:03 – This is a unique performance by the actors on this show – Jesse (John Stamos) and Joey (Dave Coulier) sing “LOUIE LOUIE” with their kids Nicky (Blake Tuomy-Wilhoit) and (Dylan Tuomy-Wilhoit), who I borrowed for the title graphic this week. We’ll sharing some more of these TV moments next week.